Grand Rapids was at one time known as the Furniture Capitol of the World, and in another example, the Paris of the Furniture Industry. 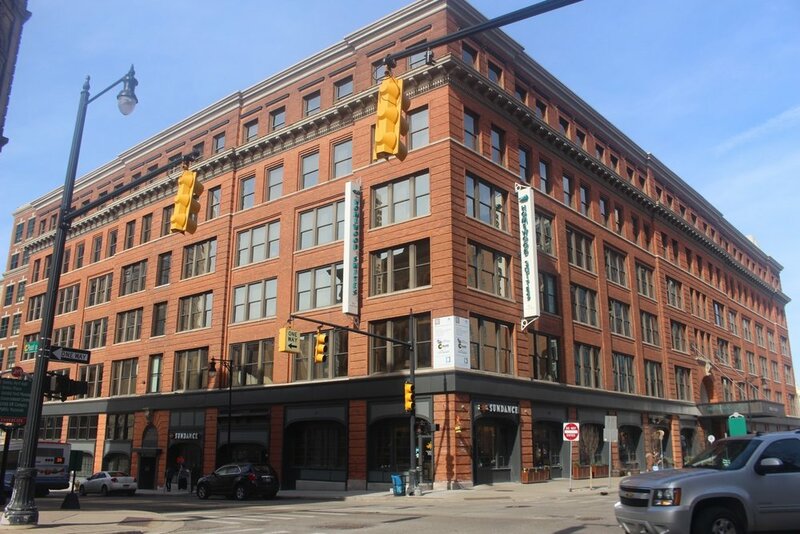 The origin of the furniture industry in Grand Rapids is associated with William Haldane and his workshop on the current site of Michigan Trust Building at the southeast corner Pearl and Ottawa Streets. The 1876 Philadelphia Exposition was one of the early national events to draw attention to the craftsmanship and quality of the Grand Rapids Furniture makers. Following the Philadelphia Exposition, around 1878, enterprising furniture makers were encouraged to create the first “furniture mart” in Grand Rapids. The markets were eventually held twice a year in January and July. According to the late Henry H. Masten, who held various offices in the Grand Rapids Furniture Dealers and Market Associations in Grand Rapids, furniture was exhibited in the late 1800’s in hotel lobbies and mezzanines, lofts, basements, vacant stores and even in the Owashtonong Club Reeds Lake. Then, along came a furniture salesman who had a notion needed a space to display his wares. In 1889, Klingman, a furniture salesman from Ohio, rented two floors of the Blodgett Building to showcase the furniture he represented. Later he formed the Klingman & Limbert Chair Co and rented the whole building. The Blodgett Building, a Romanesque style building, was covered up sometime in the last 30 years by a modern facade that was recently removed, and the building is in the process of being restored by CWD. The Blodgett Building was followed by the Waters Building, a 5-story modern brick commercial building. When Klingman outgrew the Blodgett Building, he convinced Dudley Waters to build a new larger exhibition building financed by Dudley Waters. It generally was used for samples of out-of-town merchandise and at the end of the shows, Klingman would buy up the samples and sell them at retail. During the off-market season, the building was used for the auto, hardware and other shows. A sixth floor was added a few years after construction. At the time it was considered the largest furniture exhibition building in the world. Furniture Exhibition Building/Waters Building. Photo by Pam VanderPloeg 2017. The Manufacturer's Building at the corner of Division and Fountain was designed by William G. and his son Frederick S. Robinson. It is now an important part of the Ferris State University/Kendall College of Art and Design downtown campus. Interstate Building (now FSU/Kendall College of Art and Design). Photo by Pam VanderPloeg copyright 2017. The seven-story Interstate Building at Ionia and Fountain is also a part of the campus of Ferris State University/Kendal College of Art and Design used for classrooms, library and administrative space. This original building was financed by William C. Grobhiser of Sturgis , Michigan and Charles O. Skinner of Greenville who after renting the space built an addition that extended the building further east to Division. Today is connected to the Manufacturer's Building. Furniture Temple. Photo by Pam VanderPloeg copyright 2017. The Furniture Temple was financed by Grobhiser and Skinner by selling stock to potential exhibitions according to the proportion of the floor space they would occupy. It later became an office building and today is a Lofts Apartment building. The nine-story building was designed by Osgood & Osgood on Lyon between Ionia and Division Streets. 1912 Keeler Building. Photo by Pam VanderPloeg 2017. Throughout its history, the furniture business spun off endless related industries including materials, tools and trim that helped to spur economic growth throughout the city. One of those businesses was the highly successful Keeler Brass Company. In 1912 one of the finest of the furniture exposition buildings of all was financed by Miner Keeler and his company, and was designed by architects Osgood & Osgood in the modern Chicago style. The exterior was constructed of bright red Blackstone brick laid in a Flemish bond with a generous amount of Terra Cotta tile trim on the main level and cornice. One of the defining features was the abundant three-part Chicago windows, a style known for its large middle window flanker by double hung windows on either side. The upper floors were for furniture exhibition, specifically Baker, Kindel and Herman Miller brands. The lower two floors were used as an arcade of changeable shops and venues. 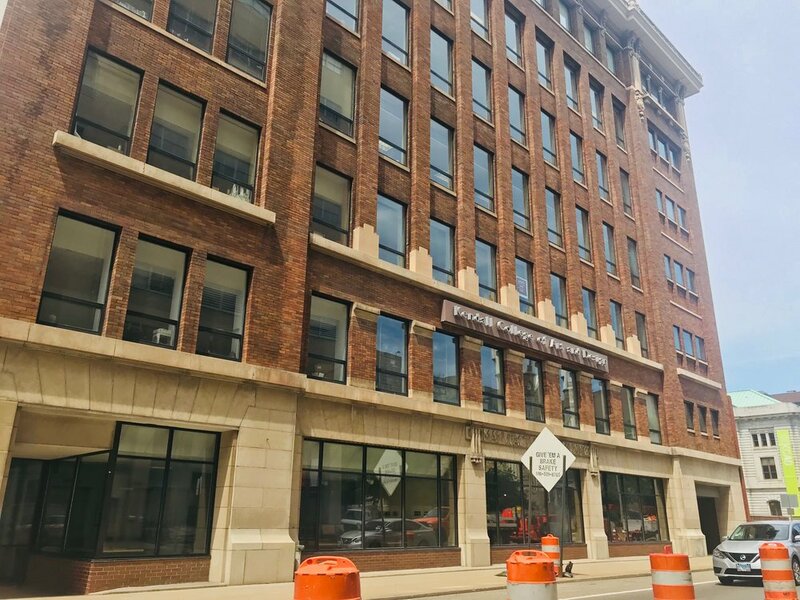 In an area, where buildings have been beautifully restored and repurposed, the Keeler Building is vacant as new owners with ambitious ideas have come and gone. Today the original cornice is gone and the windows have been replaced, and the rest of the building appears to be in disrepair. 1913 The Klingman Building. Photo by Pam VanderPloeg copyright 2017. 1925 Exhibitors Building. Photo by Pam VanderPloeg copyright 2017. In 1913, the Klingman Building was financed by Philip Klingman in partnership with Dudley Waters. They hired Robinson and Robinson to design it or the site at the corner of Fountain and Ionia. This completed a cluster of furniture exhibition buildings in the central city. 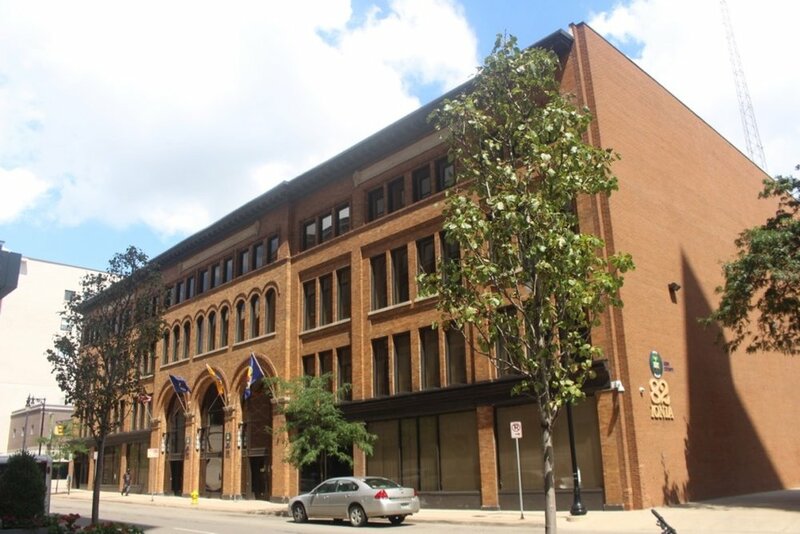 The Klingman Building was used for furniture exhibits and was a retail store, the Klingman Sample Furniture Company which also had stores in Toledo and Milwaukee. By 1925, the last furniture exposition building was completed. Architect Benjamin Hertel completed the renovation/redesign of an existing building already on the site. It was named the Fine Arts Building, and later referred to as the Furniture Exhibition Building, and sits behind the Pantlind Hotel on Lyon Street at the Grand River across the cul-de-sac from the Grand Rapids Civic Auditorium. The importance of all of these buildings declined with launch of the Chicago Merchandise Mart.